Moderate to severe dry eyes. Moderate to severe light sensitivity. Difficulty reading regular print newspapers, magazines or websites. You have also probably found out that topical over-the-counter or prescription drops or ointments do not significantly improve your symptoms or comfort. That is why we have brought our MoistureEyes Scleral Lenses (sometimes known as PROSE) technology to Alabama. Traditional methods of treating dry eyes just don’t work in Sjögren’s Syndrome or GVHD. Your eyes have special needs that can’t be met by any other method. Sjögren’s syndrome is a chronic autoimmune disease which basically means your body attacks itself. The body’s white blood cells attack the moisture-producing glands of your body causing dry eyes and dry mouth. Patients may also have problems with other organs such as the kidneys, digestive system, blood vessels, lungs, liver, pancreas, and the central nervous system. Patients may also experience extreme fatigue and joint pain. Today, as many as four million Americans are living with this disease. In a 2010 survey, The Boston Foundation for Sight found that 85% of Sjögren’s sufferers had significant success with Scleral lens treatment! PROSE devices may improve many of the shortcomings of other methods of vision correction. These devices are often a last resort to decrease the dry eye pain in Sjögren’s patients. GVHD or Graft versus Host Disease is a essentially an autoimmune disease typically occurring in transplant patients. Donated blood cells attack the recipient's tissues which can result in an extreme form of dry eye among other problems. How do Scleral Lenses help? Our MoistureEyes Scleral Lenses are custom designed to vault over the diseased or irregular surface of the eye. They help to reduce pain in two ways. 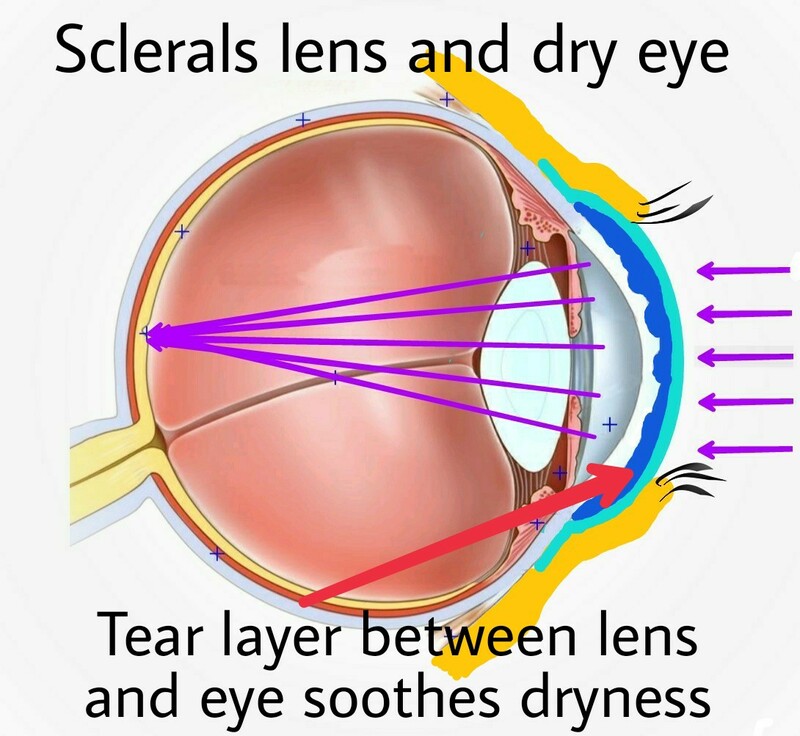 First, they create a protective barrier over the dry eye surface protecting the cornea from the mechanical rubbing effect of the eyelids(see Figure below). There are more nerves per square inch on the cornea than any other part of the body. Since the eyes blink several thousand times per day, protecting this surface dramatically reduces a patient’s discomfort and irritation. Secondly for those with dry eyes, the MoistureLoc design creates a liquid bandage lens between the lens and the cornea. This liquid bandage lens soothes the irritated nerve endings of the eye while it is worn by reducing the drying effect of the air. The moisture chamber created continuously bathes your cornea in non-preserved saline micro-environment. This allows the tissues to heal and can dramatically improve the comfort of your eyes and more importantly, the quality of your life. Vision is improved by creating a smooth, regular surface allowing light to focus clearly in the back of the eye. Look at the results! 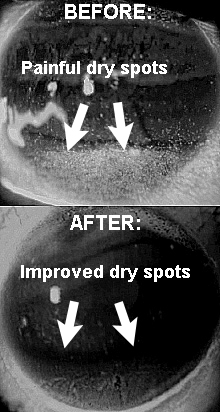 The before and after photos of a dry eye patient are shown below. The "speckles" shown on the top photo represent the painful areas of dryness. Notice the rapid resolution of these dry spots in the same eye after only 5 hours of wear of the MoistureEyes Scleral lens! Sjogren's syndrome Birmingham Optometrist, Sjogren's syndrome Hoover Optometrist, Sjogren's syndrome Vestavia Optometrist, Sjogren's syndrome Alabama. Dry eyes Birmingham Optometrist, Dry eyes Hoover Optometrist, Dry eyes Vestavia Optometrist, Dry eyes Alabama.